February has come and gone so quickly, crazy. 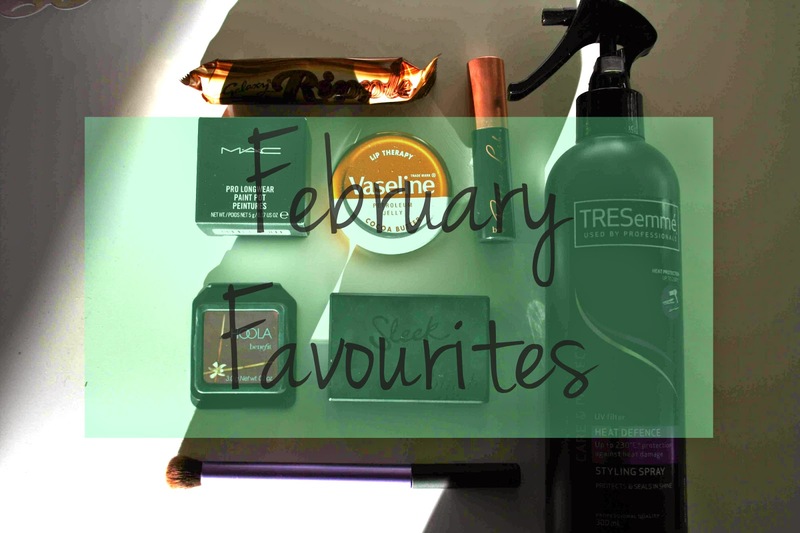 I’ve had a few new favourites this month that I’d like to share with you all! Also, sorry for the quality of the picture I was playing around with the ISO on my camera and I didn’t have time to take another picture; so had to use this one! Anyway lets get on with it. Galaxy Ripple – A food favourite of this month. I’ve been kind of addicted to chocolate this month! Galaxy has been my favourite and I’ve had a little stash of these hidden in my room which I’ve been eating most of the month, oops! Mac Paint Pot in Frozen Violet – I did a blog post on this here. Its just the most gorgeous dark purply brown shade, and it stays on all day long which is the best part really! Perfect for every day wear or evening wear, just loved it. Benefit Roller Lash – A new launch for Benefit this month, and a really good one too. I got a sample in Elle magazine, which I think you can still get this month. I have worn this mascara pretty much every day since I got it, its perfect and gives the lashes so much length I love it. I also did a blog post on it here. Vaseline in Cocoa Butter – This has been my favourite for months now anyway, I use this before I go to bed so I wake up with super soft lips. Such a simple and cheap product but such a good one that I couldn’t live without. TRESemme Heat Defence Styling Spray – I always use this before straightening my hair and its so amazing. I’d gone off using heat defence sprays as the last one I used, used to make my hair go all sticky and horrible when I used it. But this is so good, it makes your hair feel so smooth and soft after you’ve straightened it and I think helps to keep your hair straight for longer! Benefit Hoola Bronzer – I know this only a sample, but I am definitely planning on purchasing the real thing! I’ve needed this more than anything to warm up my face since I’m SO pale this time of the year, just really been loving this. Sleek Blush in Pomegranate – I’ve owned this blush for ages now, but rediscovered my love for it this month. Its a dark pink with a hint of shimmer in it, and I’ve really been loving it to warm and brighten up my cheeks! Real Techniques Deluxe Crease Brush – Not much to say about this one, just been one of my staple eye brushes most of the month and since I’ve owned it really! Such a good one for multi use, eye shadow, concealer, anything! Whats been your favourites this past month?